Basketball, music, technology & the region's finest food, craft beer & wine combine to create Pek Project's latest eco focused outdoor festival. Activities for all ages ensure entertainment for the entire family. "We want our guests to enjoy a full experience. While your children are playing in the basketball tournament, mom can relax on the lake or dad can play corn hole and enjoy a craft beer." 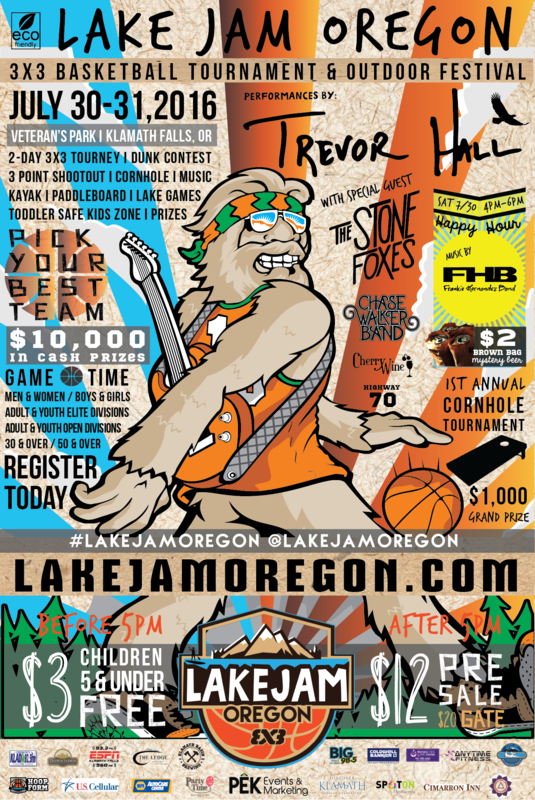 Pek Projects announces Southern Oregon's first outdoor festival and 3x3 basketball tournament coming to Klamath Falls on July 30th and 31st. LAKE JAM OREGON will include activities for all ages with toddler and kid zone, lake activities such as paddle boarding and kayaking, free morning yoga classes, sponsor and exhibitor activities, a $1,000 cash prize corn hole tournament, live national entertainment, and a beer garden featuring regionally crafted beers and wines. The FIBA endorsed 3x3 basketball tournament, driven by rfid registration and featuring the latest in basketball tech products, has already begun to attract big talent from around the Pacific Northwest to battle it out at Veteran's Memorial Park on Lake Ewauna for a share of $10,000 in cash & prizes. 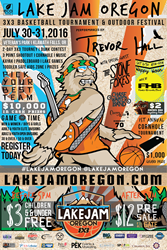 Lake Jam offers adult & youth tournament divisions and features open and elite divisions for basketball lovers of all skill levels. Open registration will continue on the official website until July 15th. 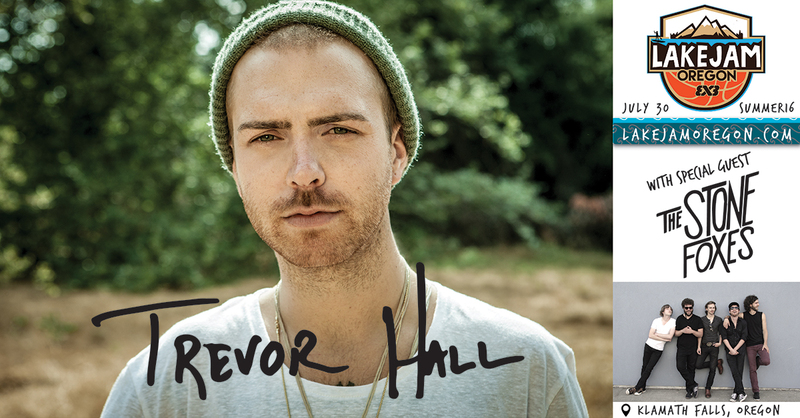 Live musical performances at the lakeside stage include national touring artists Trevor Hall, The Stone Foxes & Chase Walker Band, and are complimented by a selection of Southern Oregon's favorite musicians. "We want our guests to enjoy a full experience. While your son or daughter are playing in the basketball tournament or kayaking on the lake, mom can enjoy yoga or a glass of wine while dad plays corn hole and enjoys a craft beer," said Michael Nunes, Pek Projects CEO. Lake Jam has also partnered with entrepreneur Miss Vickie Kerr, the creator of Miss Vickie's potato chips. She will be sharing organic farm to table recipes from her new cookbook "Miss Vickie's Kitchen" as seen on CBC. Klamath Basin Brewery, The Ledge, City of Klamath Falls and many other exhibitors will be joining in on the fun. In addition, Lake Jam is focusing their efforts on reducing waste by using recycled papers and materials for marketing, on-site, and post event. "It is important that we set a standard for our event and for our guests. We not only want people to enjoy our festival & the beauty of Klamath Falls, but also to be responsible for doing our part for the environment," said Nunes. Sponsored by Klamath Falls Downtown Association, Klamath County, US Cellular, Discover Klamath, ESPN Radio, City of Klamath Falls, Napa Auto Parts, Klamath Women’s Clinic & Birth Center, and Hoop Form Basketball. Pek Projects was created in 2015 and aims to reach the ultimate vision of their partners seeking technology and sustainability programs for their events. Working closely with all partners, Pek takes pride in their communication, project management, and execution abilities.